1 of 4 Prepare cheesecake crust according to package directions, except stir in sunflower kernels. Press mixture onto the bottom of an ungreased 8-inch springform pan; set aside. 2 of 4 Prepare cheesecake filling according to package directions, except increase milk to 1 3/4 cups and stir in orange peel. Spoon filling into crust-lined pan, spreading evenly. 3 of 4 In a small microwave-safe bowl combine chocolate and shortening. Microwave, uncovered, on 100 percent power (high) for 1 minute. Stir until melted and smooth. Pour melted chocolate into a small resealable plastic bag; snip a small hole in one corner. Pipe chocolate over filling in a spiral pattern. Starting at the center of the cheesecake, pull a toothpick through the chocolate to create a swirl. Continue to create swirls around the entire cheesecake. Cover and chill for 1 to 24 hours. 4 of 4 Using a small sharp knife, loosen edge of cheesecake from side of pan. Remove side of pan. 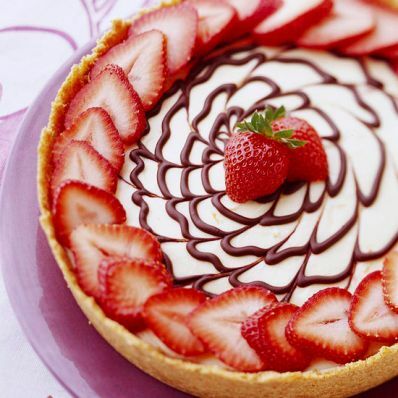 Before serving, arrange strawberries around top edge of cheesecake.